A 4 and a 3.5 Musser marimba. Mallatech Jazz Classics JC12, Mainieri MM17, and Mainieri MM13 mallets. iRealbook app and amp. A red Sonar S class fusion drum kit. Zildjian 16″ A custom Rezo crash and 18″ K custom Hybrid crash,20″ Custom Dry ride, 10″ A splash,14″ Meinl Benny Grebb series sand hats. A DW collectors series black snare. DW 500 double peddel. DW 500 hi-hat stand, LP Jam Block, Remo active snare dampening system, Pearl Firecracker snare, Evans G1 plus coated heads. Roc -n- Soc seat, Innovative Percussion Ed Soph’s, Pro-mark sticks. Regal Tip classic brush. My Mom teaches elementary and middle school band, choir, and general music. My aunt does elementary and middle school choir. I grew up around music. When I was little I would march with my moms band in her Christmas parade playing my little tikes toy snare drum. I love music and couldn’t imagine doing anything else. I am preparing to study Jazz Performance at Marshall University where I have almost full tuition scholership. I have hopes to tour and play jazz. I am currently active in the school jazz, concert, marching, and pit orchestra. Gary Burton, Mike Mainieri, Dave Samuels, Milt Jackson, Stefon Harris and Blackout, Spyro Gyra, Jeff Hamilton (trio), Elvan Jones, Philly Jo Jones, Roy Hains, Benny Grebb, Miles Davis, John Coletrane, Cannoball Adderley, Michael Brecker, Charlie Parker, Oscar Peterson, Louis Armstrong, and many more. 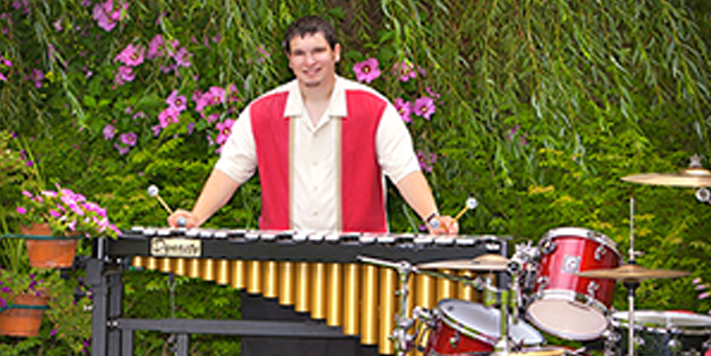 Jay Ware- head of percussion and jazz percussion at West Liberty University. (Graduate of Jacobs school of music). Rick Parsons- Local jazz artist. Plays with Pittsburgh River City Brass band. Completing my degree in jazz performance with plans of traveling and playing. Also Possibly something with music tech.